← Last chance sign up today (or walk-in tomorrow) for the ‘Pre-Bloom Decision Making for Your Orchard’ Workshop…..This Friday, March 8th, 2019, From 2-5 PM; Free for HVRL members! 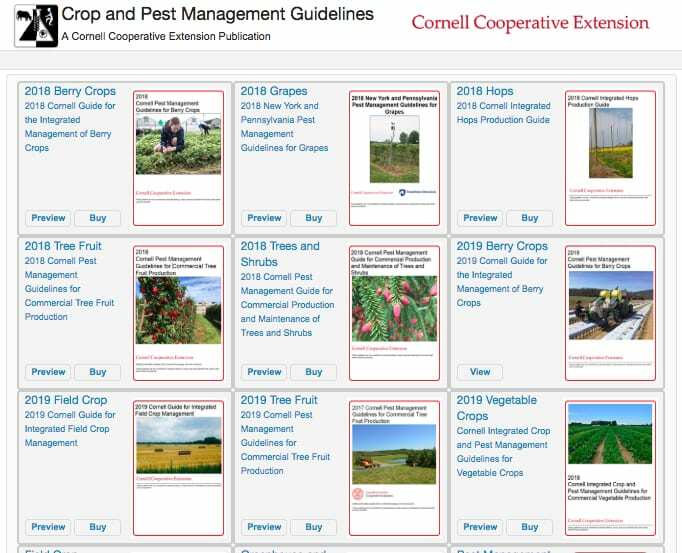 The Cornell Guidelines (click link) offer the latest information on topics such as pest management, crop production, and landscape plant maintenance. Each title in the series is updated by Cornell University researchers and Extension specialists and is designed as a practical guide for: agricultural and horticultural crop producers; turf and landscape managers; crop consultants and industry advisers; Extension educators; Master Gardeners; and pesticide dealers. If you are not using a Cornell department account number this web store will add nonrefundable sales tax to ANY order that is shipped to an address within New York State (NYS). If you need tax exempt status please call The Cornell Store: Monday – Friday 8:30am – 5pm toll free (844) 688-7620, Eastern Standard Time.